The New York Hilton was a bit disappointing. I have stayed at Hilton hotels before, in Bali and Vancouver and although these two hotels were very different, they were both excellent. The New York Hilton is not. I know that hotel accommodation in New York City is very expensive, but after paying 305 USD a night (which was a special conference rate), I had expected better service and a more stream lined experience than the one I got. 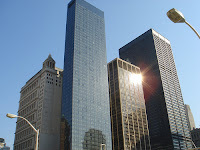 The location is ideal for almost any visitor to New York. On the corner of 53rd Street and Avenue of the Americas, it is a short walk away from Broadway, Times Square, Central Park, MoMA, 5th Avenue shopping and more. The hotel employees were all helpful and accommodating. Service could still be hard to come by: We were waiting in line to check in, to check out, and to get into the dining room… And the bleeping elevators were always busy. First of all, I was shocked to find that after paying 305 USD including tax a night, breakfast was not included. After waiting in line to get into the dining room for breakfast, I found out that the continental breakfast was USD 26 and the American breakfast USD 29. The dining room itself was like a hangar – huge and noisy. So we had breakfast around the corner. I attended a conference at the Hilton and lunch was included. There was a choice between 5 different kinds of sandwiches, served in a cardboard box with a bag of chips and a cookie. The sandwiches were good and healthy, but the cardboard box was dreary.